The conference will be held in Jan Błoński Room at the Royal Arsenal in Kraków (ground floor, room 06), at the Jagiellonian University’s Faculty of Polish Studies. Royal Arsenal, also known as Ladislaus IV Arsenal (pl. Arsenał Władysława IV), was erected at the foot of Wawel Castle in 1533 by King Sigismund the Old (Zygmunt Stary). Situated just next to the Grodzka Gate, the Arsenal was a part of the city’s system of fortifications. Not far away from it, the defence walls joined the castle’s defences closing the ring of fortifications around the city. Thoroughly rebuilt by Ladislaus IV Vasa (Władysław IV Waza) in 1642, the Arsenal has since born his name. The rebuilt structure of brick and stone blocks in early baroque style replaced the original, single-storey building with two garrets on the sides and three gates. It housed more than 50 cannon and a foundry. The decorative, rusticated portal of the central gate, the foundation stone of black marble and its inscription, and barrel vaulting on the ground floor are all preserved in the building from the time of King Ladislaus IV Vasa. There is a similar portal, possibly made by the same team, standing nearby in the Congregation of the Mission (Vincentian) monastery at ul. Stradomska 4. In the 19th century, the building was twice rebuilt and increased in height as it was transformed into barracks. The construction of the fourth floor, hidden behind the parapet wall, was associated with a critical simplification of the façade in the modernist style which took place in 1927, when the building was, in turn, adapted to the needs of the Institute of Geography of the Jagiellonian University to the design of Stanisław Filipkiewicz. Since 2005, it has housed the Institute of Polish Philology of the University. 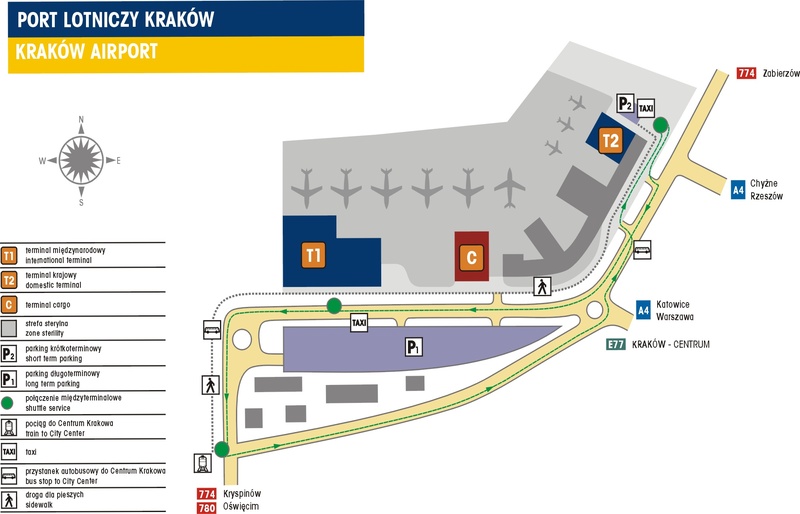 Kraków has a relatively small airport, with one international (T1) and one domestic terminal (T2). or last, and in this case the least, using public transport; quite unluckily, the airport is operated by so called “zonal” or “agglomeration” buses, which means that ticket prices are inversely proportional to the frequency of buses; moreover, they are now highly overcrowded because of the mentioned cancellation of the airport train. There are 3 bus lines: 208, 292 and 902 (the latter operating at night). Since all of them head to the Central Railway Station, it is best to depart at the last stop, “Central Station: East” (“Dworzec Główny: Wschód)—which is conveniently the last one (and closest to the Old Town). If any of these information is not sufficient for your needs, you may always use a traffic planner provided by the Kraków Aiport at its website. Since all of those travelling to Kraków by plane or train sooner or later end up on the Central Railway Station which is one of the top local transport hubs. However, whilst it is quite easy to get in the Station, it may be a bit trickier to get out—the key to succesfully navigate through the maze of shops at the neighbouring mall (“Galeria Krakowska”) is to follow all signs directing to the Old Town and Pawia St. or to head directly to Jan Nowak Jeziorański Square (all of them labelled on the map below) bordering the junction of Lubicz, Pawia, Basztowa, and Westerplatte Sts. use public transport, primarily tramways that are quite good at bypassing gridlocks during the peak hours (approx. 7-9 A.M. and 3-5 P.M. in the City Center). All bus & trams timetables may be found on a vintage website of the Cracow Transport Company (MPK), but since we realise how Polish stop names may be confusing, we recommend using the interactive map where one can mark start and destination points by simply clicking on the desired place on the webasite JakDojadę.pl. The biggest advantage of our conference venue is its location within the historical City Centre which means that everything in this vicinity is in walking distance. Take trams or buses only if needed since they maneuver around the City Centre (across Planty Park) and will not be of much help in getting from the Central Railway Station to the conference venue.